So, the crazy knitting project is well under way. As predicted, it’s challenging, at least compared to what I usually do i.e., projects that use just one yarn and have plenty of “little attention required” sections in them. I have to stay alert and count all the time with this one. The first piece is the strap/bottom of the bag, which is knit in the round as one section. Halfway through, you do a series of short rows to build a wedge into the bottom so that the bag is wider than the strap. The worst mistake I made on this section was getting off on an entire row of the insertion and having to rip it all out and do it again. I had plenty of times when I lost track of what I was doing and had to back up a little to fix things, but everything looks OK now. I haven't blocked this yet and didn't want to bother just for a photo, so I've pinned open a section of the strap and of the bottom of the bag to show the patterns. Note for anyone actually doing this colorway of the bag: I swapped the gold and purple because I didn’t like how it looked with so much of the gold (turmeric) yarn in it. I’m not sure I like this any better – the insertion and the main strap patterns look like they belong to completely different projects. Fortunately, it’s the bottom of the bag and shouldn’t really show much. 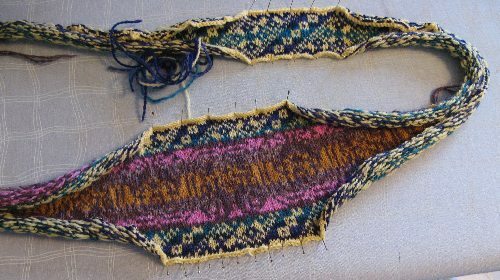 I have started the next part, which is also knit in the round – knitting the front and back all at once. It’s actually proving simple so far (knock on wood) and since the number of stitches decreases every three rounds, it will get faster as I get farther along. Studio Makeover: I Can See The Floor!